My mind is still bursting with thoughts and insights from Relevant. It was a phenomenal conference, y'all. Words cannot adequately describe how breathed-of-God the weekend was. I am still trying to process it all. When my mind cannot fully absorb these BIG experiences, it focuses on the smaller details. David drove to Austin with a friend today. When he saw these two chairs, he immediately thought of me. He texted me a picture and bought them on the spot. Only $35 for the pair! These chairs are super cute and comfy. But what warms my heart even more than this bargain is that my husband KNEW that this is exactly what I would like. Forget being newlyweds, marriage just gets better and better with each passing year! I love how David loves me. How he shows me he loves me. And how he often knows me better than I know myself. Well, there is one thing that happened today that shows he doesn't know me as well as he or I thought. I had my very first pedicure today. My feet are happy, soft, scrubbed and polished. Do you like the color? It looks more pink in person. David asked me how much it cost. I told him $50, which comes out to $5 a toe. Come on, like *I* would pay $50 for someone to paint my toenails!!! Besides, I already told him that I had it done at *cough* Wal-mart *cough*. The spa pedicure was only $20. Okay, 'fess up now. Are you proud of me for getting a pedicure? Or do I lose major points for it being at WM? PPS Aren't feet impossible to photograph in any sort of natural stance? PPPS What does a pedicure go for in your area? i left a really good comment then got a stupid blogger error and it didn't take. i love your chairs though. I wonder if you'll make some cute pillows to brighten up the chairs. Pedicure? About $3. Yep. But I can guarantee the tools are NOT sterilized. At your own risk. Lovely chairs and piggies! That is an amazing deal on the chairs, they look so modern...Great Hubby! The chairs rock my face off. an he send two more to me in Oregon?? Sooooo proud of you for getting a pedi!!! Next time... polka dots, 'kay? I had NO idea they do pedis at WM?? I had no idea you could get a pedi at Walmart. Wow! I like the chairs. Very nice. You got a pedi? Does this mean we can do that now together, when u come to Florida? They are about $25 here for the not-so-basic pedi. I usually get the full treatment which is $45. Everything us ultra clean and it includes foot mask, parafin, scrub, warm towel wrap, leg massage etc! I also have a full pedi spa in my house. Yep, I love me a pedi. Your pedicure is splendid as well. I need one ASAP. Love the chairs. They're perfect. I love the Chairs! So cute! And isn't it a blessing to have such a wonderful husband? I know I am blessed with mine! As for the pedicure...I think it is great that you treated yourself! I get mine done at Wal-mart as well! I think they do a fabulous job on my nails and toes! The cost here is the same I believe. The chairs are cute and I can't believe you found 2 chairs that look brand new for $35 each let alone $35 for both. I have had a pedicure ONCE and it was one of those 50 dollar ones and I hated it. They tried to scrape the sides of my feet with a big rocky stone thing and I don't have dead skin on my feet. I don't have bunyuns, corns or callousses. It hurt and I hated it. I decided no more pedicures for me. If I want to scrape half my feet off with a big ped egg I will do it at home. I have never had a pedicure and would jump at the chance for a Walmart pedicure. Although our Walmart is small town, so the only we have at WM is Subway. I can't believe *you* got a pedicure! I'm so proud :) Maybe us girls can get them together--we'd have to get Coco on board and I'm positive Mom would pass. I usually pay $30-$40, but it's been a long while since I've had one (and I need one!) I'm a sucker for the leg/foot massage and scrub so I always get the not so basic one. Also, I LOVE the chairs! And I really love love that David saw them and knew you would like them, too. Sweet :) I love you, Marshy! Love the chairs and the PRICE! IKEA? I have gotten them a WM before it's fine. They are regulated just like any other place. They go for $25-30 around here. Well you have beautiful feet, Marsha..there's NO WAY I'd put a photo of my feet on my blog lol... and the chairs are awesome..what a deal! A perdicure in my area is $30..but in California we have a lot of Asian pedicurists and they don't charge a whole lot. Their businesses thrive far more than any others here. Love your chairs, Marsha! I also love that your hubby knew you'd love them and bought them for you! That's just true love, right there. You all have such a great marriage! Love your pedicure. I've never had one. When I was having acrylic nails put on, I did it at WM. We have two here and one nail place was definitely better than the other. I only had a bad experience at the one I didn't care for and it's something that could have happened anywhere. I liked having my nails done at WM and don't see anything wrong with it. Lots of people do it because it's more affordable and the people are professional! I will never get a pedicure...germs ya know. You gets points for it being at WM though! Nice chairs! LOVE your chairs! And what an awesome bargain! I love your pedicure, too! I've had mine done at WalMart but they went up to either $25 or $30 depending on the day. The last time I went was the night before I had Haden. I went to CoCo nails. It was $27 and I even got a hot rock massage. I'm glad you enjoyed Relevant! I love the chairs and the story behind them...precious. I have never had a pedicure so when I read that it was $50 I nearly choked along with David! You crack me up, $5 a toe! I'd expect your toes to have twirly lights for that kind of money. Now that would be BLING! 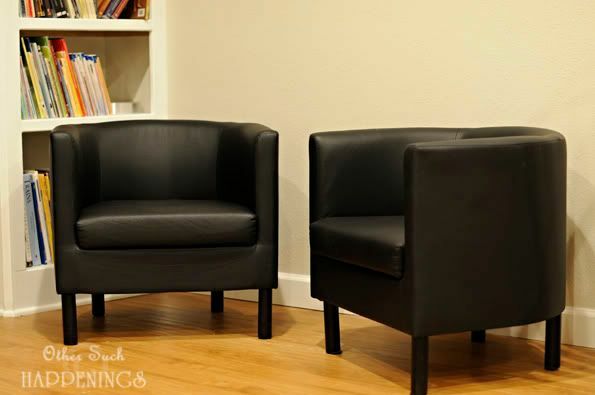 While sitting there in those (awesome) chairs with those (beautiful) toes (I'd get mine done @ WM, too, I'm such a cheapo and it's so conveniently located), do a little thinking about what to post about Relevant. I followed the Tweets, but I'm dying to get the scoop from you. Pedi's??? The BEST thing ever...better than a massage, facial or any other spa treatment. I love them. Run of the mill place here 25-30 bucks...but for the best one $50-60, for a full lower leg massage too. Love them, but wait until someone decides to give me a gift certificate. Wowza, girl - your hubby got a smokin' deal!!! I love those chairs, too - and they're even better looking for $35!! I must admit, I've never ever had a pedicure or manicure, so I have no idea what they cost! Okay, I'm going to be the only one to say I hate the chairs. They're waaaay too modern for me, and I guess if you accidentally fell asleep in one your head would fall off cause there's no place to rest it!! Ha. But I love that your husband knew you'd like them and picked them up for you!! They show they're thinking about us in different ways, huh? I've had two pedicures, and they both nearly killed me. I'm totally squeamish about having my feet and legs touched, and I don't like to go to Asian places, which is pretty much all there is around here, because they don't speak English and they watch weird Animal Planet shows about animals killing each other!! However, I would go to my mom's nail lady. She's American and charges a bundle! I'd rather have a manicure. Your feet look GREAT! But, more importantly, I'll bet they feel fabulous... You Go Girl!!! I love pedicures. I read the blue light sterilizer doesn't do the job. That scares me, but I still risk it! A. Chairs are very cute. Your hubby definitely should score extra points for getting a bargain and buying what you like. B. My feet are one of the few parts of my body I like (aren't women weird?) but I don't generally try to photograph them. First: we should have left Relevant and had ourselves a vacation!! Obviously, we both needed it. Whew! Second: he thought of you when he saw the chairs? No way! Awesome! My hubby would not even SEE the chairs!! Ha! Third: great pedi!! The toes are looking posh!! Lucy insisted on seeing your feet... Do you know how hard it is to find a pic of "Marshy's feet"?! But then I hit the jackpot with this post, 3 yrs later :) I'm not really sure why she had to see your feet, though... She's so strange sometimes!